At Summit we do things a little different than most churches, we do not take an offering in our services. We have offering boxes at the back of the auditorium where people make the intentional decision to honour God with their tithes and offerings. Blessing God and His Kingdom with the first of our financial resources is a deep value at Summit. As people who believe that all we have is from God, we give in grateful recognition of this. As people who want to trust God in every area of our life, we give because it is an act of faith. As people who long to honour God, we give as an act of obedience. As people who love God and love people, we give as an expression of this love. Life is hard enough and giving to support the mission of Summit shouldn’t be difficult. You can give using two convenient methods; pre-authorized giving from your financial institution and using your smart phone. We have teamed up with PushPay to make digital giving convenient and easy. 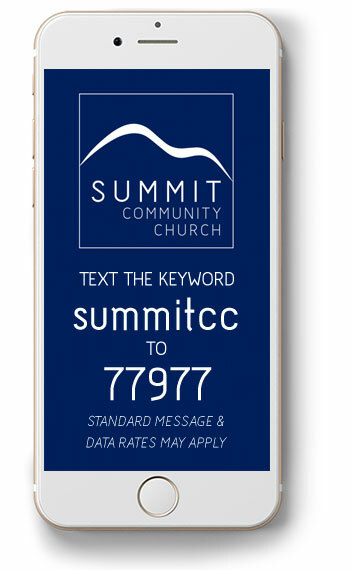 We offer online giving though this website or you can text the keyword “summitcc” to 77977 to give via your smart phone. You will then be invited to download our free giving app so your next donation can be completed in less than 15 seconds from your mobile device. Standard Message & Data rates may apply. Click here to download the preauthorized giving form and forward it to the Summit Community Church office. Thank you for giving to Summit. Your generosity helps us continue our mission of guiding people to know and intentionally follow Jesus Christ.